In winter, the bare bones of your garden layouts are exposed. But is your vegetable garden layout still pleasing to you? Do you glance out the window longingly? Or do you shy away from the window, as if the whole yard were an endless to-do list? Better understanding the design of the center and the edge, and the design implications of the materials you choose to build your garden with, will sharpen all your garden layouts. Yes, your building blocks are still garden paths and garden beds, but how those elements interact is everything. Here’s a secret for every edible garden designer (rookie or pro doesn’t matter): When like your garden layouts, it’s more fun to be in the garden, and when it’s more fun to be there, chores like weeding and staking and pruning have a much better chance of getting done. So what are we waiting for?! Let’s shift your entire garden aesthetic from perfunctory blah to fulfilling “ahhh”! Rudimentary vegetable garden layout is all about maximizing your site’s most congenial garden bed locations (which you found when doing your site assessment). But we want to go further! We want to maximize ease, grace, and beauty. Gorgeous vegetable garden designs focus on the rhythm of two figures: the garden bed, and the garden path. Later, you’ll need to know how to size beds and paths , but let’s start with some graceful garden design arrangements to consider to coordinate with your house, lifestyle, and personal aesthetics. In our design overview, we brought up three basic garden design style examples: Asian, English, and Italian. 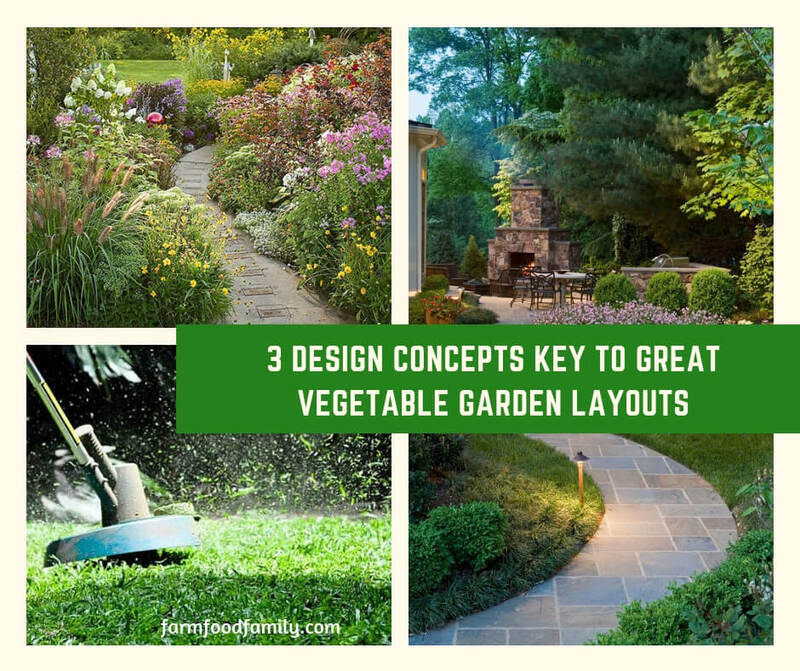 There are a dozen more, minimum, but these three get some core vegetable garden layout concepts across: abundance, symmetry, balance. Here, we go further: center, edge, and materials. It’s that simple: can you stroll across the center of your garden, as you could in this image, from Dumbarton Oaks in Washington, DC? Or is something in the way? Perhaps a water fountain or an herb knot garden? Part of this choice is about vista. If there is a beautiful view in the distance, don’t put something in the center, but do put something in the way. Translated: Don’t stop the eye from traveling, it makes your garden look larger, but do thwart the body from moving there too quickly. That makes the garden feel larger. Even a small lot, a tenth of an acre or less, can feel larger if you can’t see all of your vegetable garden layout from anywhere but out the upstairs windows. Knot your garden path and put a bench at an eddy (deadend). If the space is truly small, you’ll want to lengthen the path precisely because you can’t draw out the eye. Use the garden hose to play with garden path ideas as you work on your vegetable garden design. Can’t find suitable edibles? Sacrifice a little space for a lot of grace and go with a non-edible instead, as long as it is not poisonous. You cannot use yew in an edible vegetable garden because you cannot explain to children that that one berry cannot be eaten when all the others can be. Outside the edible garden, no problem, but inside, No. Yes, you are planting gorgeous plants. No flower garden bed I’ve ever planned has been as easy and as lovely as the right combination of nasturiums, beets, and chards. But seasons change, even in Hawaii, and you need to plan for that. The materials with which you build your garden paths, garden structures, and garden bed edges will sharpen the focus of your design through out the year. Remember your lawn mower and weed whacker. Don’t set yourself up for years of annoyance fixing chipped blades or replacing battered brick. Build your bed edges high enough and tough enough to deal the weekly assault. You wanted a nice vegetable garden, layout be danged. Don’t spend your whole first spring laying pea gravel when you should be digging the garden bed and setting out the transplants. Gardening is like painting in very slow motion. You’ll get it wrong sometimes and want to rip it out and start over. Go the season. Start fresh next spring if you really really have to. Hopefully, in the meantime, you think of the littlest change that will make the biggest difference.